In a Daily Evening Express letter from an unnamed 79th Pennsylvania soldier, we have a new "first" in the life of the Lancaster County Regiment (and apparently Pennsylvanians in the Western Theater): the first shots exchanged with the enemy. The occasion was a scouting party out in the countryside beyond Munfordville and the Green River in the direction of Horse Cave, Kentucky. Slaves provided reliable intelligence, and one of Col. Hambright's companies scared away rebel cavalry. There were no reports of casualties. Also exciting for the Lancasterians was the arrival of Sibley tents, teepee-like canvas structures that were received very favorably by the soldiers for their warmth (especially with the addition of a stove in the center). Finally, from the January 31, 1862, it is now apparent that the author of the letter signed, "A Pennsylvania," in Franklin County's Semi-Weekly Dispatch is Capt. Morris D. Wickersham of Company E, 79th Pennsylvania. I didn't connect the dots in last week's post, but the letter is the same and its full text can be viewed here. 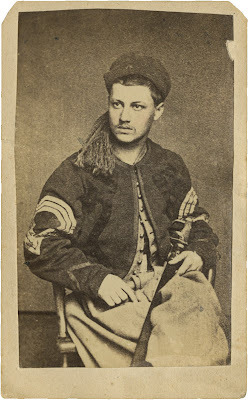 Having enjoyed writing this past weekend's post about Adam C. Reinoehl--a soldier in 76th Pennsylvania "Keystone Zouaves"--I thought it would be fun and timely to draw attention to the only Zouave unit recruited in Lancaster County. Specifically, men from the bustling Susquehanna River town of Columbia helped fill the ranks of Companies I and P, 23rd Pennsylvania, also known as "Birney's Zouaves." They were recruited by Lieuts. C. C. and B. F. Haldeman of Columbia, and a roster of men was published in the Columbia Spy on January 11, 1862 <link>, as well as on February 1, 1862 <link>. I have just finished "45's" letter in your last week's "Spy," and we cannot see what we have done that they are for everlasting slurs at us. He ("45") says that if we were with them it would do more honor to our old town. We might perhaps have enlisted in Company "K" of the 45th if the captain had been a native of our town, and we had known under whom we were enlisting. As for freezing and starving we would inform them that we have plenty and more than we nee to wear and eat. We might have turkeys and chickens too, if we would take them. 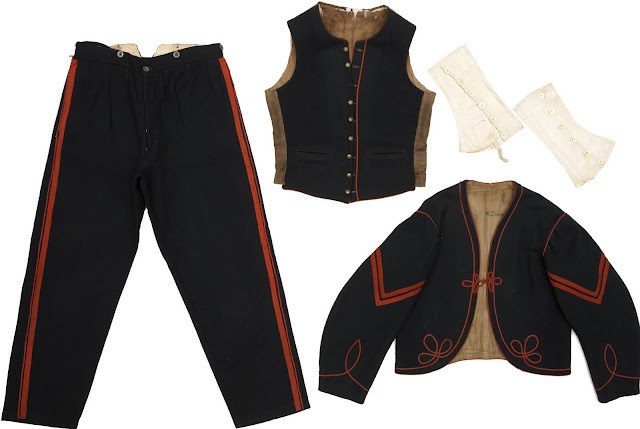 As for the "peg-topped trousers" and being called "Zoo Zoo" we would also inform them that a great many of our boys enlisted before they had seen or even knew what kind of trousers that were to get, "peg-tops" or not. I suppose the reason that they throw their slurs is, that we are digging holes (as they call it); but I can see no difference in building forts to defend our capitol and in occupying a place after the fighting is all over. We do not want any of their pianos or sofas as we came for "Union soldiers" not as gentlemen. We have all been furnished with an extra blanket, and the Colonel has given us a comfort, and have now two suits, and more shirts, drawers, and stockings than we can wear. We have also the Sibley Tent, which we have raised on logs, thus making it very comfortable. We have never asked (as we have been accused) for anything from our Columbia friends, but we have heard that a box of stockings and globes that were to have been sent to Company "I" were sent either to the 45th or the 5th Reserve, but as they need them more than we do we do not complain as they are all used in one cause. There are likely many more letters published after April 1862, but this is as far as my browsing has taken me. This is another company of the Army of the Ohio (Co. A, 9th Indiana), which was not connected to the incident described in this post. January 17 marked the 150th anniversary of the first time soldiers from the 79th Pennsylvania were fired upon. Unfortunately, it was by other Union soldiers who did not recognize the detachment of the 79th Pennsylvania led by Captain William G. Kendrick. Fortunately, nobody was hurt and Kendrick's men barely even noticed the volley from afar. 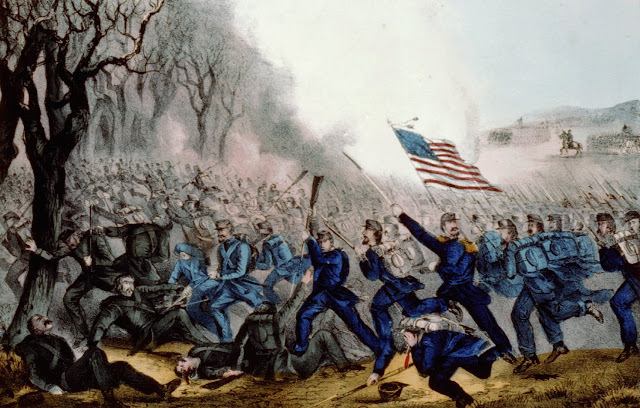 The events leading up to this situation were part of a two-day adventure into the Kentucky countryside by Companies A, B, and F in pursuit of Confederate cavalry that was harassing the farthest advance of the Union picket line. 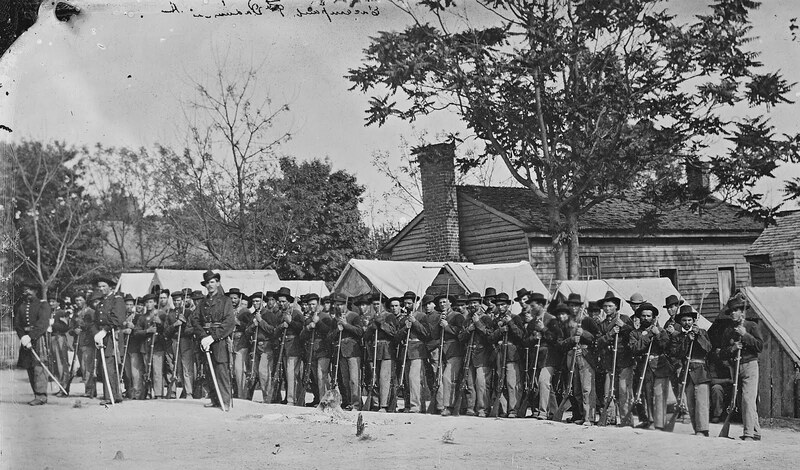 Kendrick's expedition included dramatically charging across an open field against a woodlot that turned out to be devoid of Rebels, saving over a hundred cords of wood which Confederates had tried to burn on their retreat, arresting a "noted secessionist", and interacting with civilians surprised to see Union troops for the first time. Four companies of the 79th Pennsylvania were sent out to make a reconnoisance to Horse Cave. Arriving at that point, they heard firing, which seemed to come from their rear, when they suddenly conceived the idea that it was the enemy, and that they were likely to be cut off. This was enough. It is believed the Pennsylvanians became panic stricken. At Horse Cave, where the railroad and turnpike diverge part took the turnpike and part the railroad, coming together again at Rowlett's station. Which party it was that despatched the courier is not clear--most likely the party that returned by the pike. Judge of the mutual surprise when they met at Rowlett's. It was supposed that the firing was on the left, and played the will-o'-the-wisp caper which so frightened the Pennsylvanians. In the hurried retreat of the Pennsylvanians they scattered the report that the enemy was approaching to attack us. One of the Pennsylvania soldiers wrote a phrase-by-phrase retort to be published in the Louisville Journal, a copy of which appeared in Franklin County's Semi-Weekly Dispatch--available online here as part of the Valley of the Shadow Project. 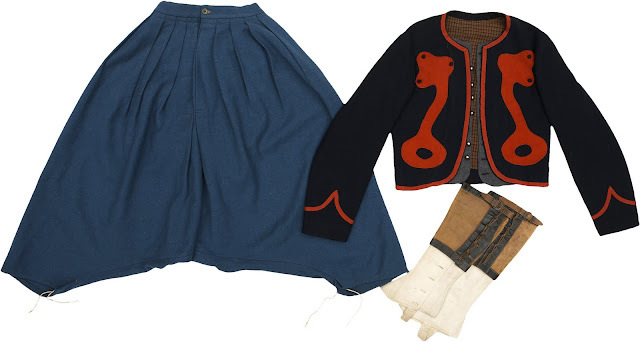 Pre-war Life: Sailor from 1837 to 1847. Married Anna Louise Stoddart in 1849 in Delaware and had several children. Supervised bricklaying contract for Lancaster County Courthouse. Local government connections. Post-war Life: Architect in Lancaster. 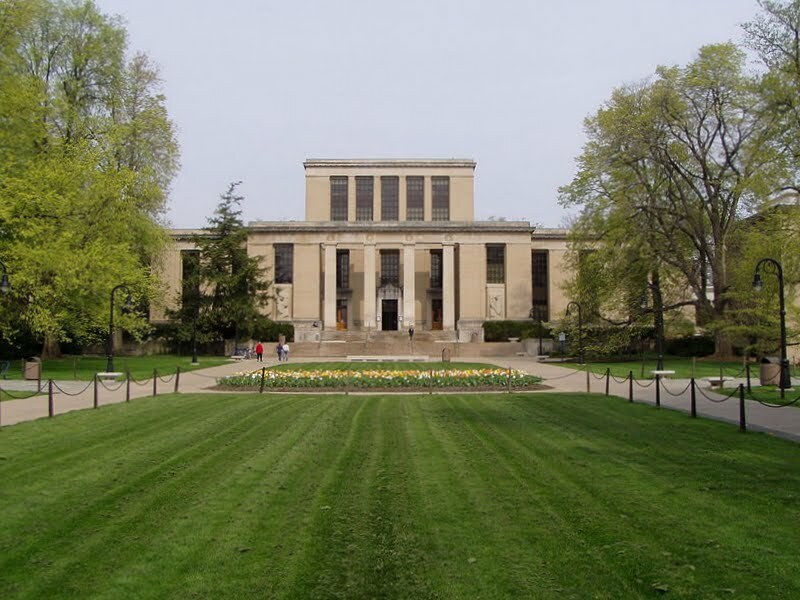 Moved to Springfield, Ohio, and Fort Wayne, Indiana, where he died. Key Events: Captured with men by Morgan's raiders while on work detail in May 1862. Battle of Chickamauga. On the battlefield, very few men acted like they had less to lose that Capt. 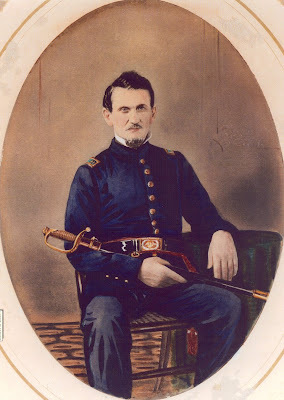 William G. Kendrick, but when it came to returning home to their families few men acted like they were missing out on so much by being away in the army. 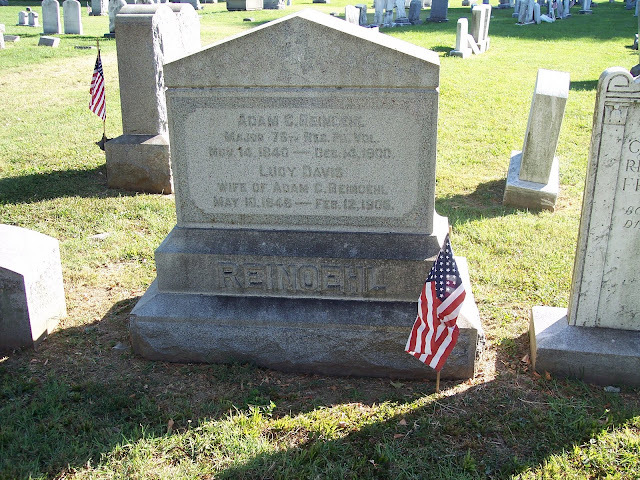 Kendrick, the senior captain of the 79th Pennsylvania and seemingly Col. Hambright's right-hand man, made a name for himself as a daredevil: first when narrowly escaping cannibals while sailing around the world, then as a captain in the 79th Pennsylvania, and later as a staff officer to Brig. Gen. James Negley of the 14th Corps. Fortunately, Kendrick left behind one of the best collections of private letters related to the 79th Pennsylvania, which his descendents have published and made available <here> (warning: file size is very large). Kendrick writes to his wife with extreme self-confidence regarding his competence as a leader, his favored status among Col. Hambright's line officers, and a bluntness about those he deems poor officers. His letters recounting his close calls in battles and the risks he took on independent expeditions must have terrified his wife. I'd call him arrogant or narcissistic, but he has some pretty good letters of recommendation in his file to back him up, including one from Gen. George H. Thomas. Kendrick also writes openly about homesickness and the emotional challenges of leaving his wife and young children and going off to war. Kendrick appears to have had talents in the building trades which he employed during the building boom of the 1850s in Lancaster. 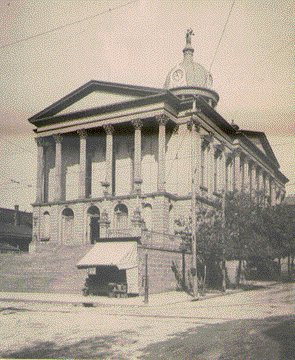 Searching the Lancaster Intelligencer for his name during the 1850s gives some of the details of work he supervised, including a contract for $8,800 to do the brick masonry work for the Lancaster County Courthouse. Before the war, it also appears Kendrick was active in Lancaster City's Know Nothing Party during the 1850s before getting in trouble for some breaching some secret related to the order. The economic downtown appears to have hit Kendrick hard though, as he repeatedly states that we would resign as soon as he had enough money to stabilize his family's situation. Highlights of Kendrick's tenure as officer included dining with Confederate cavalryman John Hunt Morgan after a telegraph detail Kendrick led was captured by him in 1862, working hard as a staff officer during the Battle of Chickamauga, and then supposedly giving up a cot he found to Gen. Thomas the night after the 14th Corps made its famous stand at Chickamauga. Earlier in the war, Kendrick led a detachment of the 79th Pennsylvania on a daylong expedition into the countryside, and the next post will focus on the excitement that resulted from the excursion. A letter from Lieut. Ben Ober of Company K, 77th Pennsylvania, at Camp Wood discussing the miserable weather, relationships with fugitive slaves, army movements, and a death in his company--that of Corp. Maris Alexander of Martic Township. This post marks the one hundredth post on this blog, and in conjunction with that small milestone I thought it would be good to highlight the top ten most popular posts since I began the blog last August. Thank you to all who have stopped by to dive into the history of one Civil War regiment and community. As a reminder, comments and questions (especially if something I write isn't clear or you don't understand the context) are always welcome. In fact, if you have any questions about things you either didn't understand when you read them or would like to know more about please feel free to post them as comments below. I'm also interested in what you find most interesting, so I invite you to comment below about what has stood out to you in your visiting this blog. Also, what would you like to hear more about? 7) Research Surprises: Millersville University and the "Normal Rifles"
Lancaster's mayoral election of early February 1861, which hopefully will give us some insights into the racial and political views of George Sanderson. 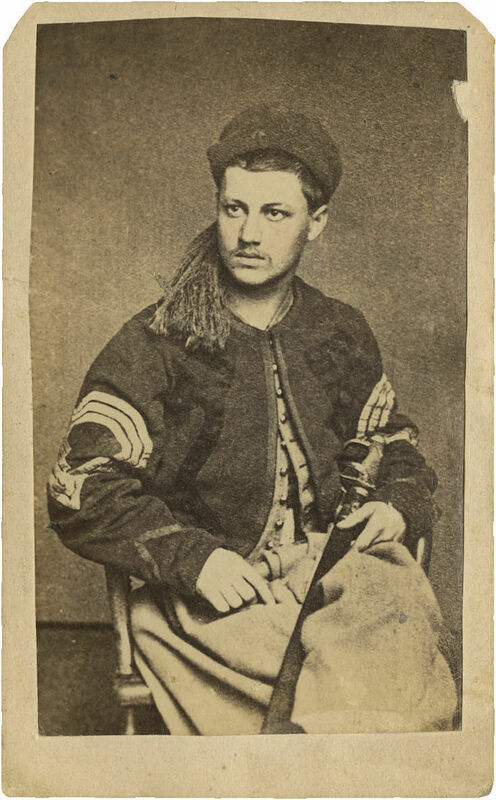 Posting dispatches from gentleman reporter Josiah R. Sypher as he travels through the Western Theater visiting his brothers and the 79th Pennsylvania. Covering the 1862 General Synod meeting of the Lutheran church in Lancaster which included a significant discussion on slavery. Including letters from multiple soldiers, sailors, and Marines serving on board gunboats on the Mississipi River. Posting my 2006 exhibit at the Lancaster County Historical Society on how Lancaster remembered the Civil War. 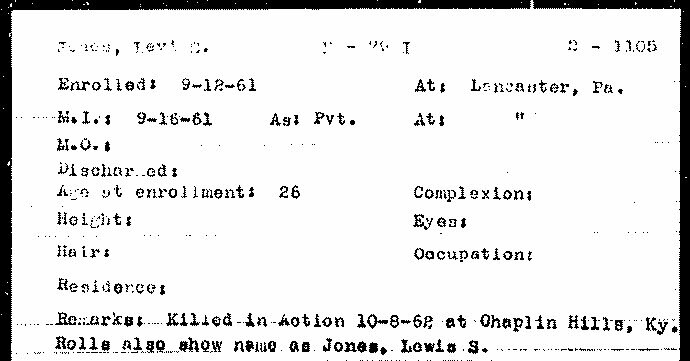 Lewis Jones unofficially served as a cook for Company H, 79th Pennsylvania. Occupation: Listed as "engineer" in 1860 census, although he was working in a restaurant for a Lancaster County miller named Jesse P. Ronk due to an economic downturn that hit Lancaster's industrial development pretty hard. Death: Killed at Battle of Perryville, Kentucky, on October 8, 1862. 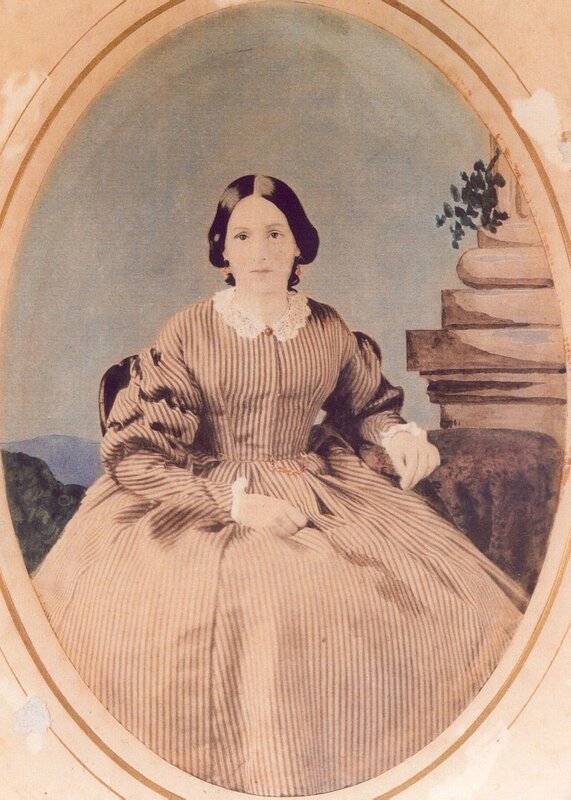 Family: First marriage in 1844 to Mary Ann King with child William Henry Clay in 1845. 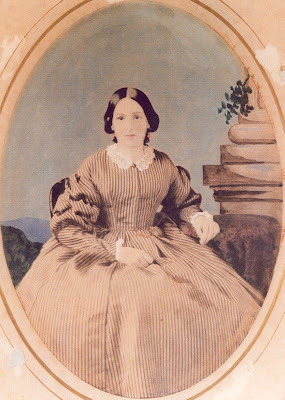 Second marriage on April 7, 1844, to Elizabeth Boullay/Boley/Boulalay with children: Paul James (1851-1853), Joseph Franklin (b. 1853-1933), Glancy (1855-1864), Washington (1857-1930), Theresa (1859-1940), and Freeland (1861-?). 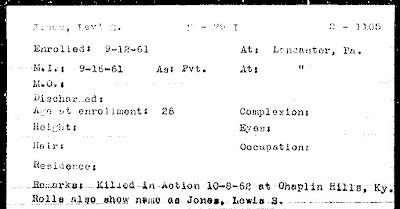 PA Civil War Veterans' Card File record for Lewis H. Jones. Any research attempt to get accurate picture of the men of the 79th Pennsylvania suffers from a serious selection bias. Illiterate soldiers tended to produce fewer letters, for instance. Moreover, letters from soldiers to families that could be described as the working poor or working class seem to have had a very low chance of being saved. Instead, the strongest historical voices from the Lancaster County Regiment come from well-educated men who hailed from economically stable families, often with deep roots in Lancaster County. Fortunately, we have a great exception in a year's worth of letters in the collection of the Lancaster County Historical Society from Pvt. Lewis H. Jones. 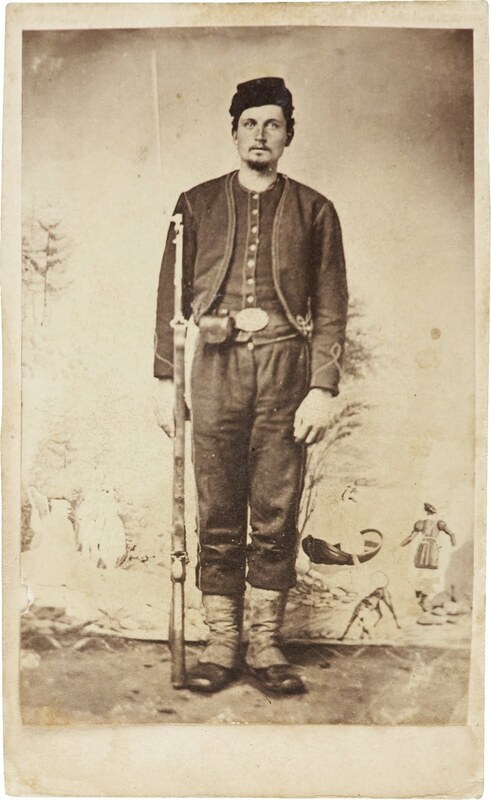 Jones was one of a number of a identifiable group of "South Queen Street boys" who enlisted together in Company H, 79th Pennsylvania, and part of a family to whom the Civil War brought compounded tragedies. Jones' letters offer fascinating insights into how one soldier tried to help his wife, their four-then-five children, their relatives, and their neighbors avert disaster that always seemed to loom right around the corner. Tragedy struck, though, nine days later when Jones' brother-in-law, Joseph Maxwell of Company C, 79th Pennsylvania, died on January 6 after minor complaints about irritation in the bowels somewhat suddenly took a fatal turn. Jones, who would write letters for the illiterate Maxwell, and now took care of sending the body back to Lancaster for burial (at the cost of $40) and tended to Joseph's effects over the next month or two, sending much of his clothing back to Lancaster. As winter wore on, Jones' family, his sister-in-law's, and other South Queen St. families with men in the 79th Pennsylvania faced serious challenges for finding food, fuel, and medical care. Lewis Jones even shipped discarded army clothing and food (dessicated vegetables with instructions to make soup) to his wife in March 1862 while the regiment was in Tennessee. There was even a political and patriotic aspect of their suffering, as we'll revisit Elizabeth Jones, her sister, and her mother when they write an editorial in response to a smear campaign by one mayoral candidate against another that involved them. There are many letter excerpts I'd like to present and historical angles to explore (what the letters say about relief work, marriage, life in the regiment, etc. ), but I've hit the ceiling on the time I want to spend on this post. I'll refer you to his letters, housed and transcribed at the Lancaster County Historical Society, and recently published in a book linked below. Lewis Jones Family Papers at the Lancaster County Historical Society. A Patriotic Destiny: From Lancaster to Perryville by Elwood Jones. This book was written by a descendant and contains the LCHS letters interspersed with historical fiction. Newspaper accounts of Joseph Maxwell's funeral.